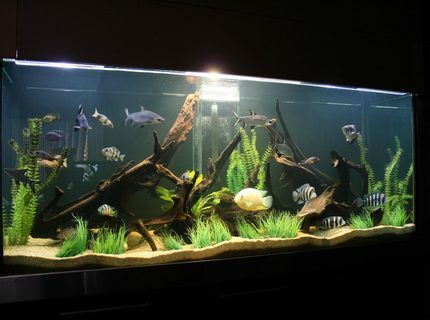 Fish Kept: African Cichlids mainly, frontosa , peacocks , servrum , have some big silver sharks in there as well as lots of catfish and loaches. Quote: Fish keeping is damn addictive! About Yourself: Young business major trying to find my dream job. Got into the hobby about 3 years ago in college with a little 5 gallon. I now have a 75 gallon and a 20 gallon long. 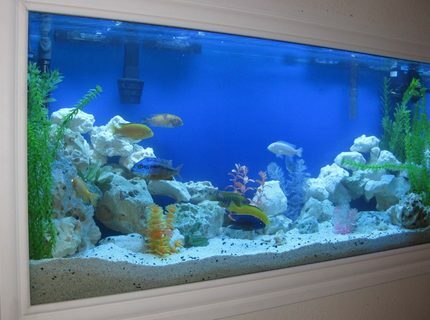 And I love cichlids! 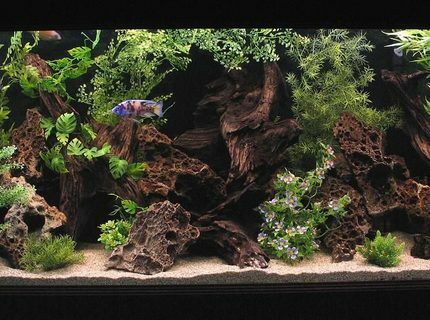 Advice: Read up on fish species before adding to your tank. Make sure they are compatable. And study the fish at the LFS. If they don't look healthy dont buy them! 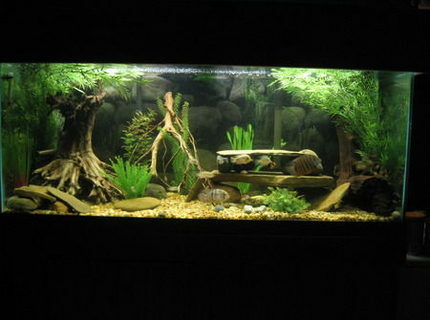 Fish Kept: African Cichlids from Lake Malawi. 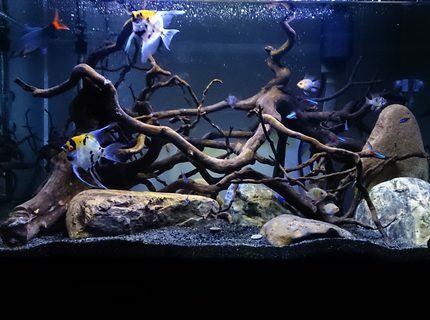 Mostly Peacocks and Mbuna. Several Bushy Nose Plecos. 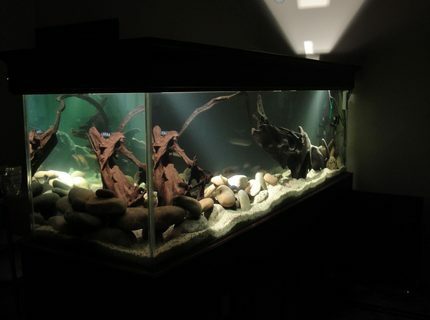 Description: 180 Gallon Show Tank. About Yourself: passionate animal lover. owned everything but fish up until a year ago. started with a goldfish pond, then into freshwater and now a marine. Corals/Plants: no plants. just lots of driftwood and large river rocks. 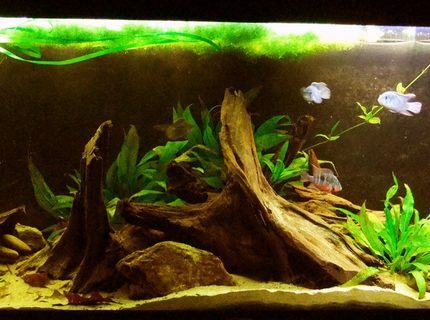 Fish Kept: Black ghost knives, Discus, Blue Acara, Firemouths, Sparkling gourami, Various Pleco, tetra, and more. About Yourself: Been keeping exotics for many years. Have Koi, parrots and snakes. 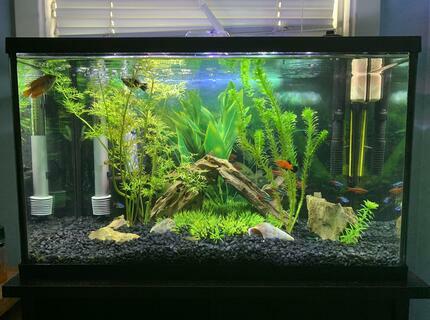 Quote: A HAPPY TANK WILL MAKE A HAPPY HOME ! About Yourself: I have 7 tanks set up all around the house. 135gal, 55gal, two 29gal, 20gal, and two 10gal. I use the smaller tanks for breeding. I myself would rather set and watch my fish than watch tv. 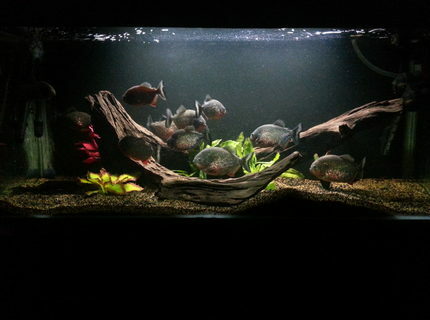 Fish Kept: All afican cichlids. 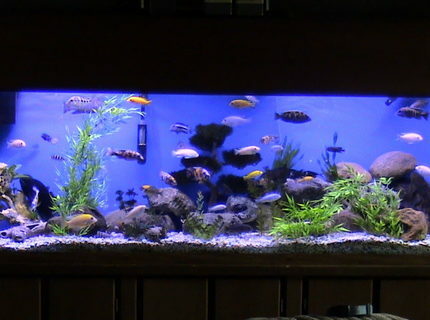 livinstonii, rostratus, venustus, (electric yellow,blue), lombardoi, powder blues, (cobalt, pearl, Red,ice blue redtop zebras) orange blossom peacocks and many many more. Corals/Plants: Can't keep live plants with these guys do to the fact that live plants are in half of their diets. They will eat them. So I have been forced to use plastic plants. Advice: It is best to know everything there is to know about the fish before you buy it. Eating habit and its natural environment. Also water condition. About Yourself: Check out my Semi DIY "Installing a Fish Tank Into a Wall"
Fish Kept: Metriaclima Callainos "Blue Colbalt Zebra", Pseudotropheus sp. Demasoni Demasoni, Labidochromis Caeruleus Electric Yellow (2), Metriaclima Estherae "Orange Blotch Zebra", Metriaclima estherae"Red Zebra", Pseudotropheus socolofi "Albino Snow White", Aulonocara Stuartgranti Ngara Flametail (Mdoka Yellow), Albino Strawberry Peacock, Sunshine Peacock, Rubescens Peacock (Male & Female), Red Empress HAP, Synodontis Multipunctatus "Spotted Catfish", Sucker Fish. Advice: Do your Research, Take Your Time and Enjoy!